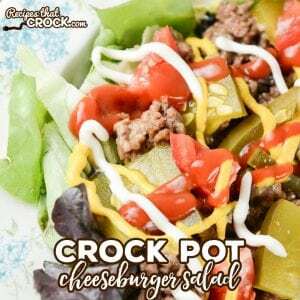 Crock Pot Cheeseburger Salad - Recipes That Crock! Are you looking for a yummy way to switch up your salad routine? Our Crock Pot Cheeseburger Salad takes all the delicious flavors from your favorite burger and turns it into a fun salad! I often get asked if our VERY popular Crock Pot Cheeseburger Sandwiches can be made without Velveeta. So I decided to give it a try and since then we have been using our altered recipe in this Crock Pot Cheeseburger Salad (and we also make them into Crock Pot Cheeseburger Lettuce Wraps too! Oh. My. Word is this recipe good! This recipe is perfect for potlucks. You can make Crock Pot Cheeseburger Salad meat and then offer guests buns for sandwiches and bagged salad for those who prefer it as a salad. The great thing is all the toppings are the same! Pickles, Tomatoes, Onions, Ketchup, Mustard and Mayo all can be used to top this yummy salad. 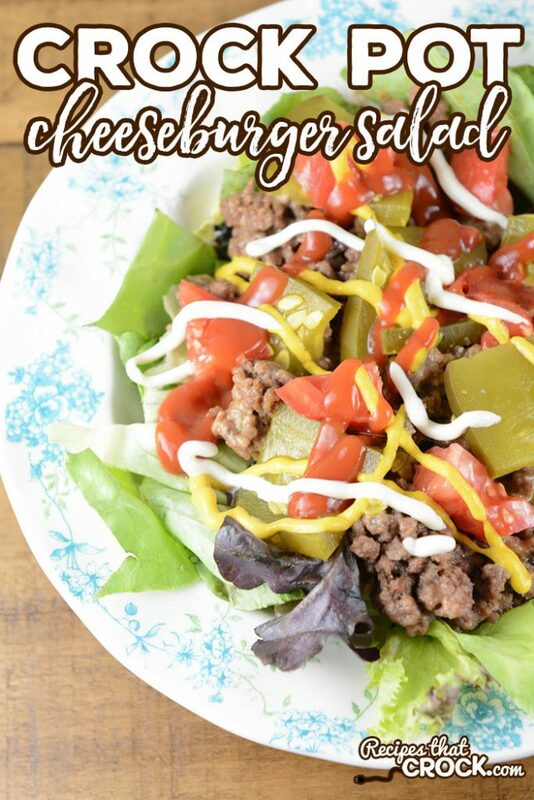 UPDATE: We love this Cheeseburger Salad so much, we often wrap it up in low carb tortillas to make for an awesome meal on the go. So much so that we recently listed it as one of our favorite road trip foods in the video below. Garnish: Pickles, Ketchup, Mustard, Mayo, Tomatoes, Onion, Shredded Cheese, etc. We used a browning slow cooker to make this a one pot meal but you can use a skillet to brown the beef and use a regular slow cooker if desired. We used shallots in this recipe, but onions are a good substitute. We like to use freeze dried shallots in our kitchen to keep them always on hand. We calculated the meat in this recipe as having 334 calories and .7 net carbs based off the specific ingredients we used. Garnish: Pickles , Ketchup, Mustard, Mayo, Tomatoes, Onion, Shredded Cheese, etc. Brown meat with garlic and shallots (or onion) in a skillet or browning slow cooker. Drain and place meat in a 4-6 quart slow cooker. Cover and cook on low for 2-4 hours, stirring occasionally.